A long time ago in a galaxy far, far away… or rather… in our living room!? 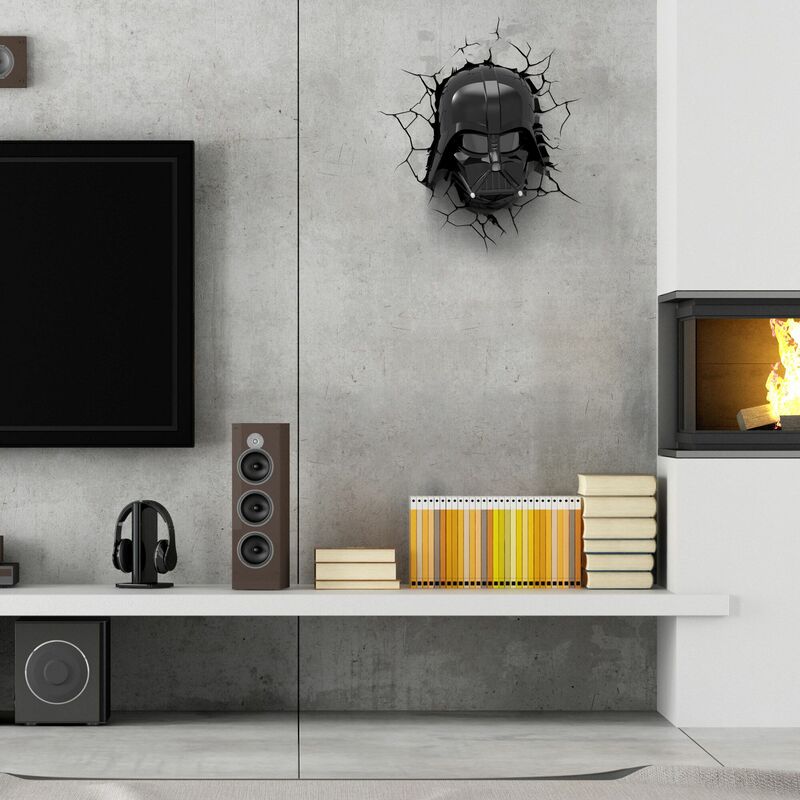 3D Light FX Star Wars 3D deco lights bring us to the dark side of The Force with Darth Vader… and he can crash into your living room too – just click here to buy your very own Darth Vader light! *deal expired* P.S. Because 3D Light FX is at Comic-Con now, you’ll get 20% off by entering code: 3DComicCon before Comic-Con ends on July 12th… P.P.S. They also have awesome SDCC exclusive mini Star Wars nightlights available – stop by booth #2913f and tell them Nerdy Minds sent you! P.S. Get 5% OFF PLUS FREE SHIPPING + extra 30 days for returns by signing up for REDcard* through this link. *REDcard has no annual fees and can be used as credit or debit drawing straight from your checking account (read: there’s no reason not to have this)! Now for what brought you here: to win a 3D Star Wars Darth Vader light (Yoda and Boba Fett can also be won – a $39.99 value) for free by entering our giveaway (link below)! (Make sure you also stay tuned for our hands-on review)! If you were ever a child, chances are you loved Star Wars. 3D Light FX lets you take that love and display it proudly with its new line of Star Wars 3D deco lights. Ranging from Boba Fett to Yoda to Darth Vader (with more to come), this is the coolest Star Wars merchandise we’ve seen in a long time… When 3D Light FX reached out to us for a review, let’s just say we were more than happy to get our hands on one (these things have been force-flying off the shelves and selling out! ): Darth Vader’s helmet is everything you’d hope it would be! Need more convincing? Here’s our hands-on review. We were sent a Darth Vader deco light to review, and it is terrifyingly accurate. When we opened the box and saw a life-size Vader staring back at us, it was a little unnerving (and awesome). This 3D deco light is an almost perfect reproduction of the original helmet! There’s no better way to describe it than to say that it looks like someone sent us Darth Vader’s actual head in a box. The light weighs little but doesn’t feel cheap. It’s light enough that it won’t yank holes in your walls but solid enough that it could take a few bumps and bangs without breaking. As kids, we played with Star Wars toys and saw Darth Vader as everything from a small action figure to a full-size helmet with voice changer… Maybe it’s the sheen, but this helmet somehow seems worlds more realistic than anything we’ve seen before. We’re thrilled to have been given the honor to review it and to spread the gospel of 3D Light FX (and to display it proudly on our own wall)! So how does this thing look on your wall? The gimmick with these lights is that they come with a “crack” sticker to make it look like the figure has just smashed through your wall. 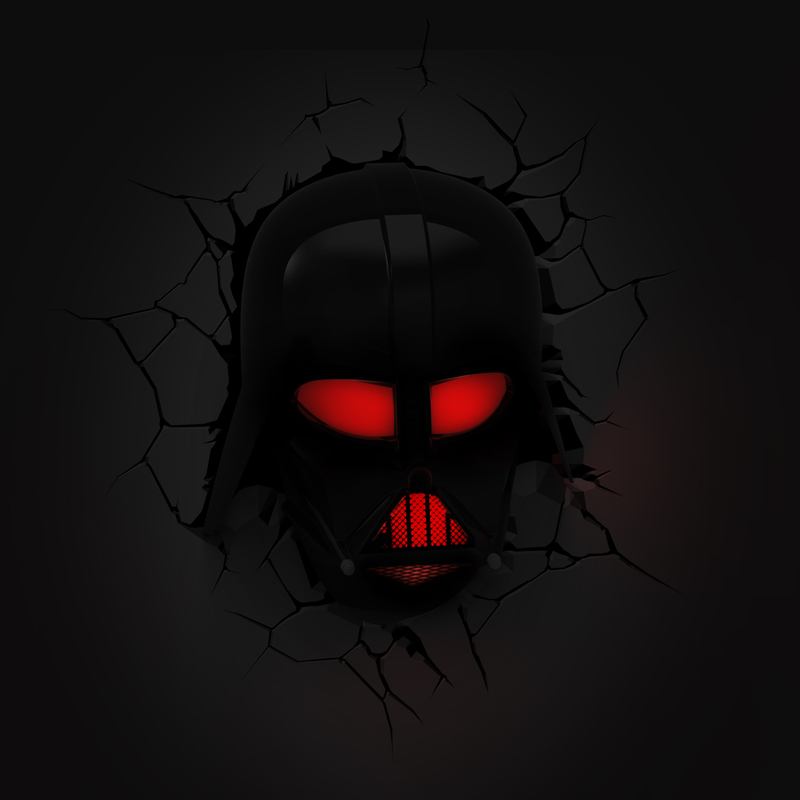 While it seems a little “Kool-Aid Man” in concept, seeing Vader’s cold stare bursting through our wall is one of the coolest things we’ve seen. If you startle easily, then think carefully before installing this light; if you get up in the middle of the night to use the restroom, you’re almost guaranteed to prematurely wet yourself when your half-asleep eyes come across this eerie sight in the darkness. 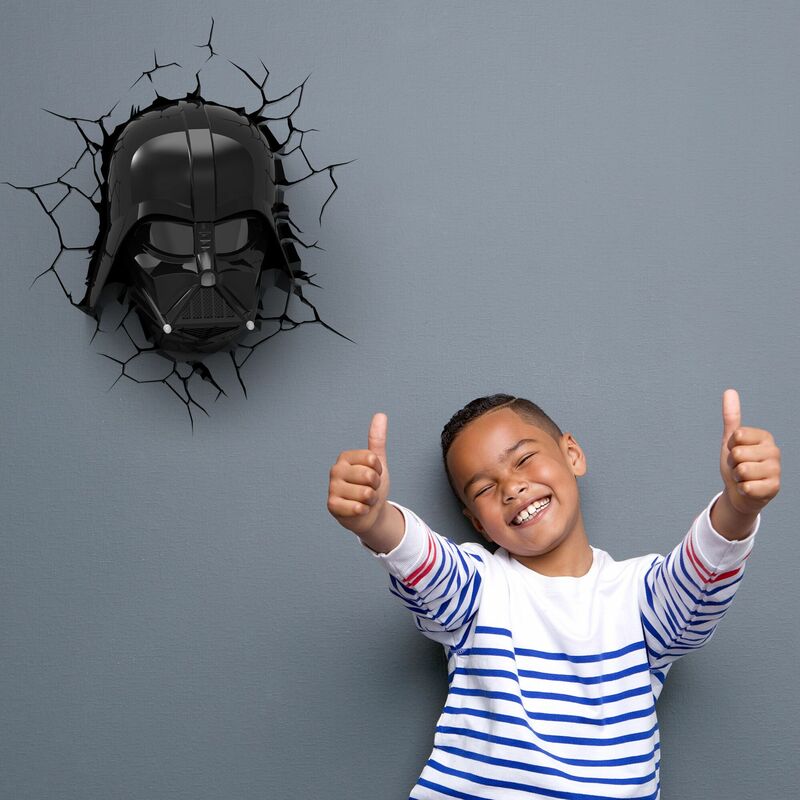 Star Wars is something we’ve not really invested in in a long while, but this Darth Vader 3D deco light has convinced us to rethink that. We’ve bought 3D Light FX products before and have never been disappointed, but this one sets a new standard. We just might have to go out and buy the rest of the line. …and crap, now we’re even more excited for Episode VII! P.S. 3D Light FX and Kool-Aid: If you’re reading this, please make a Kool-Aid Man 3D deco light for us… Sincerely, THE WHOLE WIDE WORLD. Stay tuned to Nerdy Minds Magazine on Facebook and @NerdyMindsMag on Twitter for more nerdy news, reviews, interviews, deals, and more! You can even subscribe to have each new post delivered straight to your inbox so you’re sure you don’t miss out; simply scroll to the bottom of the page (yes, all the way down) and opt in! You won’t regret it! *Buying through our affiliate links helps keep Nerdy Minds alive! Vader looks menacing enough but I’d have to go with the Bounty Hunter for the win. Wicked cool stuff here. Have to go with Boba Fett…as I already have a Darth Vader mask, Sideshow figure and lightsaber on display, I need to mix things up a bit! That Darth Vader is awesome… I’d want it even if it ends up scaring people at night. we want the Darth Vader lamp!!! I would love the Boba Fett light! Thanks for the review and chance to win one! I would love to win the Darth Vader one. I am a huge Star Wars fan and this would look AMAZING above my Darth Vader collector’s saber! Thank you guys for the opportunity and keep up the awesome website! I would love the Boba Fett light! Thanks for the chance to win !